*U.S. pressing. Contains 12 tracks total. A photo of the disc is included in the RAR file. 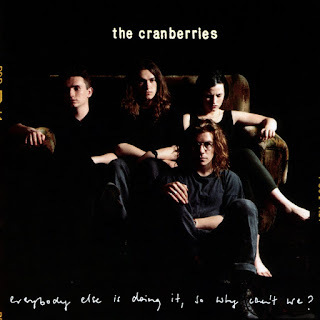 Title aside, what the Cranberries were doing wasn't that common at the time, at least in mainstream pop terms; grunge and G-funk had done their respective big splashes via Nirvana and Dr. Dre when Everybody came out first in the U.K. and then in America some months later. Lead guitarist Noel Hogan is in many ways the true center of the band at this point, co-writing all but three songs with O'Riordan and showing an amazing economy in his playing, and having longtime Smiths/Morrissey producer Stephen Street behind the boards meant that the right blend of projection and delicacy still held sway. One can tell he likes Johnny Marr and his ability to do the job just right: check out the quick strums and blasts on "Pretty" or the concluding part of the lovely "Waltzing Back." O'Riordan herself offers up a number of romantic ponderings and considerations lyrically (as well as playing perfectly fine acoustic guitar), and her undisputed vocal ability suits the material perfectly. The two best cuts were the deserved smashes: "Dreams," a brisk, charging number combining low-key tension and full-on rock, and the melancholic, string-swept break-up song "Linger." If Everybody is in the end a derivative pleasure -- and O'Riordan's vocal acrobatics would never again be so relatively calm in comparison -- a pleasure it remains nonetheless, the work of a young band creating a fine little synthesis. You're on fire, Lass! Much awaited. Salamat! My copy is badly scratched. I love this album and played it a lot when I was a kid. It took a long time to get a proper rip. I hope there are no errors. Enjoy.